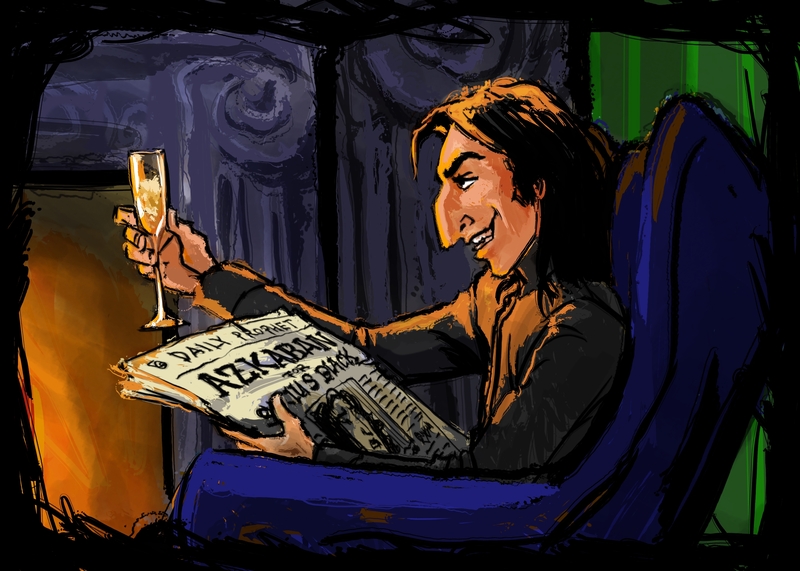 Severus sat gingerly on the ornate, brocade armchair. His elbows turned inwards to his body, as if they were as self-conscious of the grey, worn patches on his robe as the rest of his body was. He ran his tongue experimentally over his teeth under his lips to check for the third time whether anything was stuck in his gums. "Here," Lucius said, gesturing to a glass of wine that appeared next to him on a side table. Severus picked it up and watched as tiny lines of bubbles trailed from the bottom of the glass to the top, creating a dreamy, fizzy quality to the liquid's surface. He tried a subtle, experimental sniff, and saw Lucius watching him over the rim of his own glass, a look of amusement on his face. "It's champagne," Lucius explained patiently. "Oh," Severus said. He'd never had champagne before. "I thought it was...that is to say, I thought that..." He stopped abruptly when Lucius laughed. "Muggle made. Yes. Terribly uncivilised, of course, but they do have their uses," Lucius continued airily. Severus took a sip of the liquid. It popped very satisfactorily in his mouth. "How are you enjoying Hogwarts?" Lucius asked. "I don't see why I should stay. I applied for the position under direction from Our Lord, to collect information. And now he is gone—" Severus complained. "Do not lose faith, Severus. Our Lord had preparations in place for such an occurrence. Our role is simply to wait." Lucius smiled thinly. "Indeed. Don't bother asking. I was not privy to such information. But I do know he shall return to us, and I'd rather be waiting in the Manor than Azkaban." "Yes. Imperio, was it?" Severus asked. Lucius shrugged and lounged back in the chair, staring at the ceiling. "I've done truly horrendous things under the impetus of the Imperius curse. Things that shall haunt me endlessly," he finished dramatically, and took another sip of his drink. Severus didn't particularly need the re-enactment, as he'd been in the Wizengamot to witness the performance first hand. He'd sat there, the heavy chains on his wrists dampening his magic, watching Lucius pout and preen, cry endless crocodile tears of remorse and penultimately be found innocent. 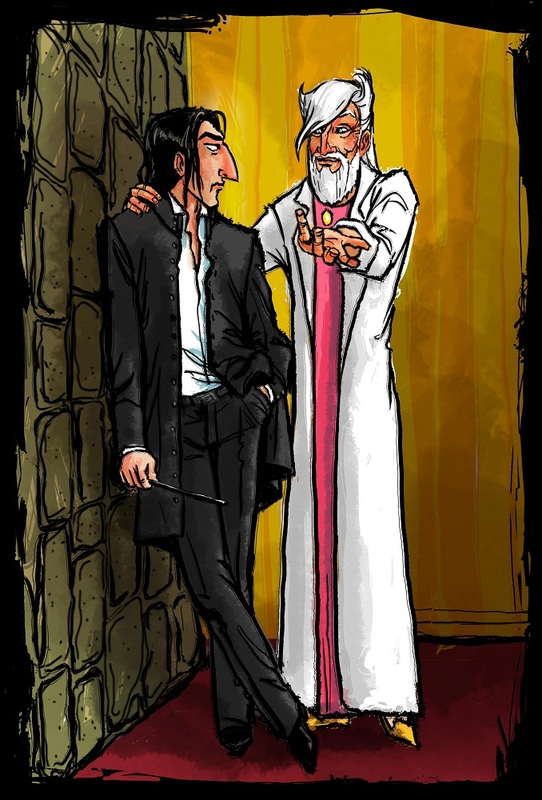 Later Severus found out that Lucius had also bribed most of the judges. Money, Severus decided, could buy all sorts of things. "Eminently," agreed Lucius, and he placed his empty glass on the counter. "Dear Bella, of course, is loyal to a fault. She'd rather rot in Azkaban than publicly deny Our Lord." Severus shrugged. He did not like Bellatrix. He didn't like her wild, heavy eyes and empty smile. He didn't like the way her gaze would flip over him. He knew she saw into the heart of him and she found it lacking. He'd seen the image of her on the front of the Daily Prophet as they took her from the court, screaming at the judges who cowered under her rage. "No, she wasn't a favourite of yours," Lucius observed dryly. He clicked his fingers and their glasses filled. "She definitely underestimated you, though. And I have to admit, so did I. Managing to convince Dumbledore to plead your case to the Wizengamot was… impressive." "Our Lord tasked me with ingratiating myself with Dumbledore and his trusted circle," said Severus stiffly. "Of course," said Lucius. "I just wasn't expecting you'd manage it. I should have. I recognised a long time ago you were a wizard of great talent." Severus sipped the drink, unsure of what to say. The door pushed open and a chubby, grinning baby with a toy wand fisted in a fat, little hand tottered inside. "Ah, here's trouble!" crowed Lucius and held out his arms. 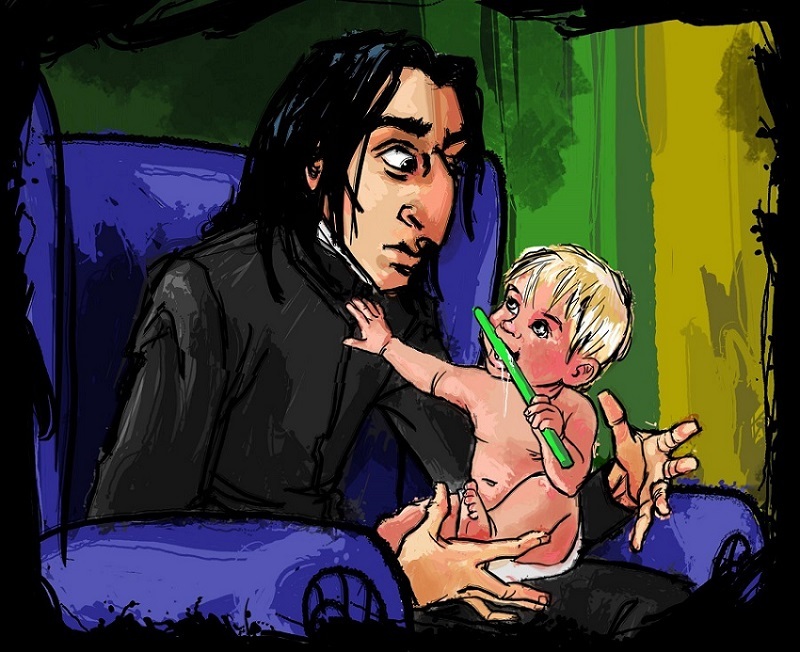 Severus watched the baby rush unsteadily towards Lucius, who leant forward and scooped the child up. He kissed a pinked cheek soundly and was immediately rewarded by the baby impaling him in the eye with the wand. Severus blinked hard, expecting the worst, but Lucius only laughed and returned the baby to the floor. The baby turned and staggered towards Severus before solemnly offering him the wand. Severus took it just as solemnly. "Thank you, Draco," he said. The child pulled himself up onto the armchair and onto Severus' lap, reclaiming the wand and proceeding to assign all concentration to chewing it thoroughly. Severus could smell Draco's hair and skin. He smelled soft and innocent. Severus looked down at the fluffy blonde hair and the peaceful expression that fell across the boy's face as Draco masticated contentedly on the wand. He felt a strange surging feeling of protectiveness. He wondered if that had been what Lily felt, and why she'd given up everything in the protection of her son. Lucius smiled indulgently, misconstruing the emotion in Severus's eyes as brought on by Draco. "That's another reason you must stay at Hogwarts, Severus. You must protect Slytherin. You know how it was there, and it will be even worse now the Dark Lord has fallen," Lucius said insistently. Draco drummed his legs against Severus' thigh as he cheerfully chattered in incomprehensible babble. "Ah, there you are," Narcissa said fondly from the doorway and Draco raised his arms triumphantly at her, shaking the wand. She smiled and walked over to Severus, gently lifting the boy who immediately snuggled into her neck. "Thank you," Severus replied politely. "Ah, that reminds me," said Lucius. He reached next to his chair and lifted a large, silver box wrapped in a green ribbon. He handed the box to Severus. "Thank you," Severus repeated. He reached for the end of the ribbons, but a sharp movement from Lucius stilled his hand. "Come now, Severus, don't be gauche. Open that at home. Besides, I have a better present for you." Narcissa shook her head and carried Draco out of the room. Lucius paused briefly to watch them exit. Severus observed his sharp face soften. "I'm not sure whether you saw this in the Prophet," Lucius said, handing a paper over to Severus. "I had," Severus confirmed tightly. He traced a finger over the headline proclaiming the arrest of Black, and the murder of seven muggles and Pettigrew. He lingered slightly on the Azkaban photo which captured Black's unhinged face in agony. "It'll be a nice little family reunion for Black," smirked Lucius. "He and Bella have a lot of catching up to do." Severus didn't say anything. He looked down at the photo again. Black murdered Lily. He murdered her when he couldn't keep his arrogant mouth shut. "Yes. I remember. He had quite the little interest in you, Severus. A particular interest," said Lucius. "He was a bully," said Severus. "He was a blood traitor," said Lucius. "The only Black that went bad." Severus wasn't quite sure what to say to that. So he said nothing. "If I remember, you thought that the Evans girl was a potential recruit," Lucius said casually. Severus shrugged. "She was exceptionally talented." "Yes, perhaps… except for her bloodline. Talented, maybe, but not exceptionally bright given her proclivity for Potter. But that's water under the bridge now, isn't it?" As Lucius spoke, there was a crushing grief that bottomed out inside Severus. How could she be gone forever? He had thought...hoped...they'd be able to mend the brokenness between them one day. Now every unsaid word would remain so. They had not spoken in a year, and she certainly hadn't been friendly to him for much longer, but he missed her terribly. He thought all these things and more, but made sure to keep everything carefully buried behind a calm, blank face. "Well, I promised you a present," Lucius sighed. He put his glass down, and smoothed back his hair. "Black was not the Secret Keeper for the Potters." Severus took a sip of his drink. "No?" Lucius smiled. "No. It was one of ours." Severus looked up and across in confusion. "Who?" "Pettigrew," said Lucius. "Marvellous, isn't it? He had been loyal to the Dark Lord for years. Dumbledore is so blind to prejudice. Of course he would never see one of his precious Gryffindors as a threat. They fell into our Lord's hands." Severus looked back down at the anguished face of Black. "You can feel satisfaction in knowing Black is paying for every one of his attacks on you. I dare say he'll be able to relive a lot of interesting memories." Lucius laughed and after a while, so did Severus. Severus opened the package within his room and examined the contents. Rich, black wool spilled out of the box. He took out the clothes and discarded his worn, faded robes. He put on the pants and retired his boots, before donning the frock coat and buttoning it down over his wrists. He looked in the mirror at the black, forbidding figure with some satisfaction. He strode to the Headmaster's office, footsteps echoing on the stones under his boots and the gargoyle swung open at his approach. He made his way up the stairs and into the office where the Headmaster was waiting. "How was Mister Malfoy?" Dumbledore asked. "He is certain the Dark Lord will return," said Severus. "I see," sighed Dumbledore. "Were you able to ascertain—?" "He knows nothing of details," Severus said, cutting him off. "He only knows the Dark Lord was preparing for the possibility of his death." "Interesting. And what of Malfoy himself?" asked Dumbledore. "He remains committed to his beliefs despite his claims to the Wizengamot," Severus said. Dumbledore nodded. "Yes, I thought perhaps that was so. Do you have any thoughts on my other question?" Severus looked away from the older wizard. "Yes. Malfoy craves power, but desires indulgence,"
"His family is his true vulnerability. His wife and son," said Severus quickly and coldly. Dumbledore smiled in satisfaction. "Excellent, my boy. And was there any other intelligence you were able to gather?" Severus thought of Black, and Pettigrew, of innocence and of Azkaban. He thought of walks through the corridors of Hogwarts, heart in mouth, awaiting the inevitable attack. "No," Severus answered finally. "There was nothing." "Thank you for your report. I'd best let you go prepare for tomorrow's lessons." Dumbledore said. "Yes, Dumbledore," said Severus. He paused. "It's my birthday today," he said with a forced casual air. Dumbledore smiled and stood up. He walked over to Severus and placed a gentle hand on his shoulder. "Happy birthday," he said. "Have a lemon sherbet."